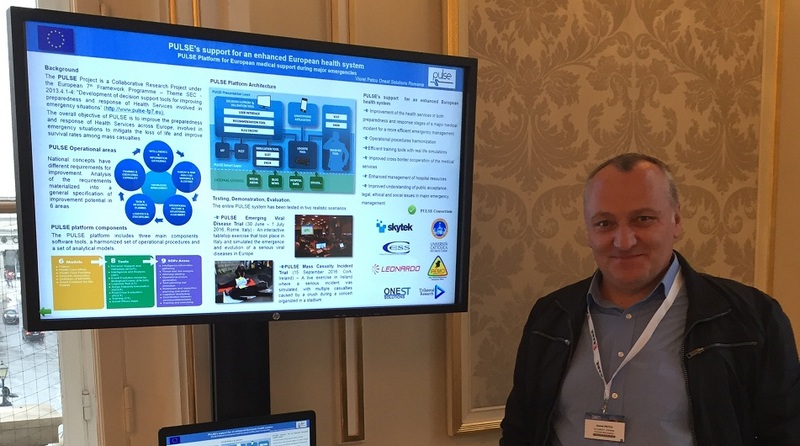 Viorel Petcu, ONEST Solutions – Romania, has attended the EUSEM 2016 Congress Vienna, Austria, on October 4th, 2016. The Xth EuSEM Congress is organised by the European Society for Emergency Medicine (EuSEM), in association with the Austrian Association of Emergency Medicine (AAEM), the German Association for Emergency Medicine (DGINA) and the Swiss Society for Emergency and Disaster Medicine (SGNOR). PULSE was presented into the ePoster – Miscellaneous section – displayed on screens in the eposters area, during the entire congress (1-5 October 2016) being easily searchable by anyone. PULSE was also presented in an oral presentation that highlighted the research stages and results as well as the PULSE’s support for an enhanced European health system. PULSE was very well received by the participants, a particular interest being shown to the exploitation potential of the project’s results.